So, you’re planning your next trip to Portugal and wandering where to stay? Be prepared, as it will be a difficult choice, with so many charming new boutique hotels in Portugal to discover. We’ve traveled from Porto to the Algarve to find the newest, chicest additions to the list of top boutique hotels in Portugal. From chic urban gems to sleek rural escapes, from modern luxury to understated style, this is Episode Travel’s selection of handpicked hotels in Portugal that you just can’t miss! The charm of Portugal, which has won the country so many travel awards, lies in a unique mix of nature and culture, heritage and contemporariness. But the Portuguese are also known for their genuine hospitality, friendliness and peaceful way of life. Which, when it comes to these top boutique hotels we’ve selected, happens to very stylish! 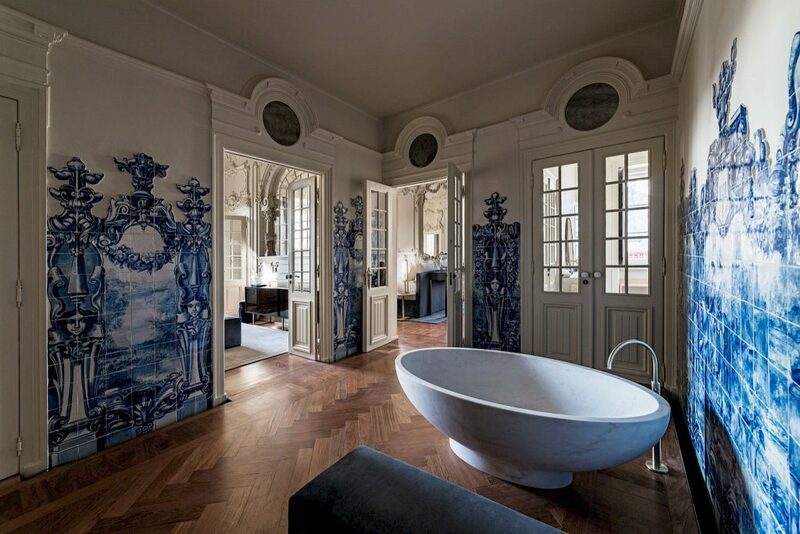 The latest addition to this super stylish list is the Torel Avantgarde, a brand-new five -star hotel in Porto, opened last September. With an artsy atmosphere – the idea is to “immerse yourself in art” – the profusion of artworks and sophisticated interiors are just an introduction to the hotel’s greatest triumph: the breathtaking view over the Douro river towards Gaia. One of the best places to enjoy this is the stunning outdoor swimming pool with a view. Or, if you prefer, one of the hotel’s charming terraces. This luxury retreat with a great location also has a Spa and a restaurant, Digby, with Portuguese flavors with a contemporary twist. Unanimously praised by the international press, Casa Mãe, in the coastal town of Lagos, Algarve, is a statement of simplicity and style. A formerly ruined 19th estate was refurbished to create a contemporary hotel full of charm with three different houses combining the old and the new in a very inspired and creative way. Overlooking the old historic quarters of Lagos, Casa Mãe is only a 10-minute walk from the beach, but this temple of slow and stylish living is perfect for a year-round special retreat. Casa Mãe is more than a hotel, it’s actually a state of mind. With an organic vegetable garden and cooking, farming and crafts workshops, it will be an experience to remember. True to its informal, yet tasteful spirit, Casa Mãe has a restaurant, Orta (a pun around the Portuguese word for “orchard”) where healthy, sunny food is served. There is also a very nice shop with an impeccable selection of crafts and designer objects to die for. If you’re looking for a unique, timeless interpretation of modern luxury, then look no further, we’ve found the perfect place for you. It’s called Verride – Palácio Santa Catarina, and it’s a new, heads-turning, 19-room luxury boutique in the heart of Lisbon. An historic townhouse was beautifully restored to house this magical place where classic meets modern in the most glamorous way. From the Bica rooms, overlooking one of the most special Lisbon’s districts, to the spacious and elegant River suites and the splendid Royal suites, with their wooden sculptured ceilings and silk panels, it will be an experience! The comfortable-chic spirit is all around you, so you will really want to make the most of your stay within the walls of this superb palace. Just don’t forget to enjoy the stunning 360º view of Lisbon from the top floor terrace. It’s worth the visit. It’s not open yet – it will be, in March 2018 – but it’s already one of our choices for great accommodation in Portugal. Located near Zambujeira do Mar, on the Costa Vicentina, Craveiral- Farmhouse is a new concept combining the best of two worlds. Halfway between the Alentejo country side and the beautiful beaches of one of Portugal’s most unspoilt coasts, the place has the right balance between seclusion and liveliness. With four groups of independent houses in different typologies (all with super friendly hotel service) Craveiral was designed to create a true communion with nature without forgetting the comfort of modern life. With 9 hectares of fresh air all around you, you will have lots of room to breathe and enjoy life at its simplest and most authentic. Indoors, you can enjoy the contemporary coziness of the rooms, decorated with contemporary design pieces and natural materials, an indoor pool perfect for Portugal’s sunny winter, or the delicious dishes of the farm to table restaurant, with fresh produce from Craveiral’s orchard.